An update for Aarohi is she was earlier getting treated in Manipal Hospital in Jaipur post which she was been asked to get treated at TATA as the parents were not able to manage the funds in the private institution and te parents wer asked by their relatives to get treated in TATA at Mumbai, therefore the parents took het to TATA at Mumbai and got her admitted after admitting for 10 days the protocol was informed for a chemotherapy for her post which the Doctors will inform w3hat next to be done based on the treatment . Further, post Chemo she was been discharged and asked to stay back in Mumbai and observe for the medication given, but the parents took a decision to go back to Jaipur and left in 2 days of time to Jaipur, while travelling back to Jaipur Aarohi got Fever and once they reached Jaipur the parents took her to Bhagwan Mahavir Hospital in Jaipur and there the Doctor said she is in very complicated situation better to admit in good Private hospital so they recommended Medanta at Gurgaon ( Delhi) Dr S P Yadav took the case and started the medication and after 5 days of medication was discharged with prescribed Medication . At present Aarohi is at Jaipur and The parents said that Dr informed we have to wait or else the only left Kidney need to be operated which means she is in very much complicate situation and further Dr and The Almighty will have to save her. I request all to please pray for her wellness and for miracle to happen so that she can live a life which she wants to . Here is an update on Arohi. Aarohi is going through a painful journey as of now. As per my discussion with the doctor today , i come to know that as Aarohi has to go through another 2 cycles of chemo's out of which 1 round of chemo was over and then a pet scan was done post which she was admitted on 18th Jan 2017, since then she has been given 3 units of platelets and other medication and till now the cost or to say bill occurred as of today is 137000 after 2 or 3 days will be discharged based on her condition and then after the last cycle of chemo again a pet scan will be performed and post which stems cell transplant will be done to cure her . I request you all please and please help her in getting the funds as she is struggling with only one kidney and that too affected by the dreadful disease. Dear all Supporters and Well Wishers! Here is an update on Aarohi, she has been in back to back treatments of chemotherapy since 1 month and recently the doctor advised for a pet scan to be done in order to go for next round of treatment which is an autologous stem transplant , but after doing the pet scan the doctor found one more round of chemo is required hence it was given and yesterday she got discharged for 4 days and will be again getting admitted for further treatment. 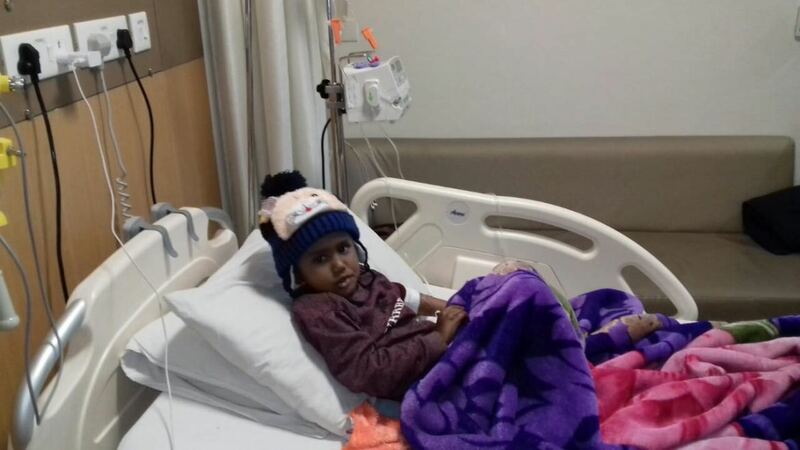 Dear Well wishers and donors I request you all to please help Aarohi and the family as they have completely exhausted all their saving and sources in her treatment. Please request you all to share to a maximum number of people in your circle to get help and donation for Aarohi and get her treated. The funds what the family had has exhausted and presently are dependent on us.So please help. Thank you for the support.